Bali Street Photographer Turns 1 Year-Old. Bali Street Photographer officially turned one-year-old on October 2018. What better way to celebrate than with an impromptu tour with Simon and his daughter Aurora from Australia. Both Simon and Aurora navigated through the busy narrow passageways with ease. They seamlessly blended into the bustling chaotic environment as true street photographers should. During the tour, I couldn’t help but notice how their photography jiwa (spirit) embodied the Bali Street Photographer manifesto. I’m honoured and pleased to exhibit some of Simon’s stunning photographs from the tour. Thank you, Simon for generously sharing these with us. Simon, Aurora, and me share the same kind of love for the Bali Dog. Simon had a magical way of bringing out wonderfully genuine smiles for the camera. And, in the early morning no less. His sheer talent for this left me a bit envious. The details of the pasar are easy to miss. Maybe because they are too obvious or they are taken for granted. The locals are usually the main draw for the average photographer and general tourist. Simon’s attention to the pasar’s secret details (beautifully reflected below) is rarely captured. So, enjoy. Recording moments as if no one is looking is the holy grail of candid street photography. Consciously being at eye-level when clicking the shutter may not seem like it matters. But, it actually makes a huge difference for the keen observer. Using layers and reflection in a composition adds another level of artistic expression to the mundane–a praise for everyday life. All photos above by Studio Gray. Please visit StudioGray.com.au to see more of Simon’s exquisite photography. Check out Simon’s Instagram for his latest feed. 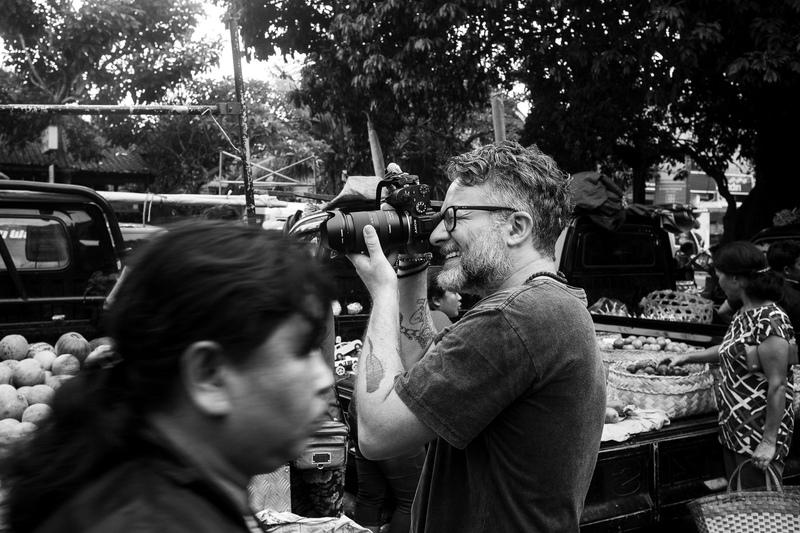 Simon in action at Pasar Ubud by mark l chaves.